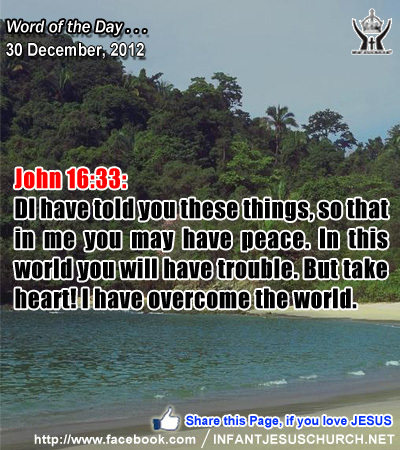 John 16:33: I have told you these things, so that in me you may have peace. In this world you will have trouble. But take heart! I have overcome the world. Heavenly Father, thank you, for giving us the victory through Jesus Christ our Lord. We greet the future with anticipation because we know each day brings us closer to you and the glorious future you have planned for all of your children. Until then, we pray that we may never lose sight of that victory and yearn for the day of its arrival! In the name of Infant Jesus, we pray. Amen. 41Now his parents went to Jerusalem every year at the feast of the Passover. 42And when he was twelve years old, they went up according to custom; 43and when the feast was ended, as they were returning, the boy Jesus stayed behind in Jerusalem. His parents did not know it, 44but supposing him to be in the company they went a day's journey, and they sought him among their kinsfolk and acquaintances; 45and when they did not find him, they returned to Jerusalem, seeking him. 46After three days they found him in the temple, sitting among the teachers, listening to them and asking them questions; 47and all who heard him were amazed at his understanding and his answers. 48And when they saw him they were astonished; and his mother said to him, "Son, why have you treated us so? Behold, your father and I have been looking for you anxiously." 49And he said to them, "How is it that you sought me? Did you not know that I must be in my Father's house?" 50And they did not understand the saying which he spoke to them. 51And he went down with them and came to Nazareth, and was obedient to them; and his mother kept all these things in her heart. 52And Jesus increased in wisdom and in stature, and in favor with God and man. While Jesus realized his unique call, he, nonetheless, submitted himself with love and fulfillment to Joseph and Mary and waited for the time when his call would be fulfilled. Like all godly parents, Mary and Joseph raised their son in the fear and wisdom of God. The Lord's act of kindness is with those who listen to his word with trust and obedience. Our Heavenly Father calls each of us to a exclusive task and mission in this life. We may not find out or understand it fully, but if we cooperate with God he will use us for his reason and plan. With the call God gives grace - grace to say "yes" to his will and grace to persist through obstacles and trials. Do we recognize God's call on your life and do you trust in his grace? Loving Infant Jesus, you came to restore us to unity with the Father in heaven. Where there is division, bring healing and pardon. May all peoples and families find peace, unity, and wholeness in you, the Prince of Peace and Savior of the world.